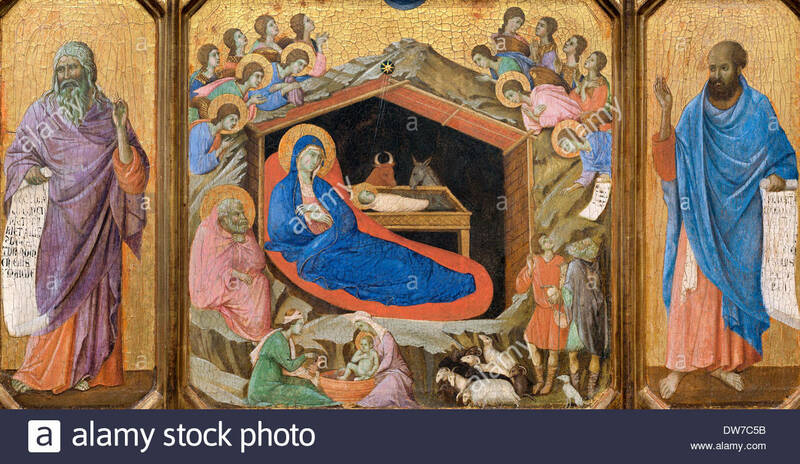 Our Nativity painting today is by a great Master from Sienna, Duccio Di Buoninsegna. For music to take you away from the daily tumult I offer you a precious work of the heart. ‘A Stor mo Chroi’ as performed by The Voice Squad (Phil Callery, Fran McPhail and Gerry Cullen) insists that we each attend to what is truly important in all our lives; the love we offer and the love we share. Where else is your treasure to be found? We are nearing the end of our journey now with our Sleigh still moving forward following a star. As you approach the end of any journey there is space for reflection on the path already traveled and anticipation of the welcome to be found at the destination. The Holy Family, weary and anxious about the straitened circumstances surrounding the impending birth of Jesus had to hold on and have faith that somehow all would be well and they would be a family. Above all Mary had to have faith that her encounter with the heavenly realm at the annunciation and the event foretold by the Angel Gabriel was miraculously true and that she would indeed be a mother to a saviour (though one she would have to nurse and nurture like any other human child). There would have been no Christmas birth without Mary’s assent at the Annunciation. From that leap of faith heaven and earth became joined and history eternally altered. Mary was in a very real sense the first disciple: accepting God’s call and following it never knowing the joys and sorrows it would entail as her son too accepted his destiny. I was an altar server from the age of seven and I can still recite the responses to the Latin mass if I close my eyes. I can also recall the way certain prayers had a profound impact on me that was probably based more on their literary and musical cadences than any theological understanding given my youth. The prayer that always moved me the most was the Loreto Litany Of Mary, the reciting of which even in an almost empty church seemed to set up a palpable spiritual vibration in my being. ‘Mother most admirable, Mother of good Counsel, Mother of our Creator, Mother of our Saviour, …. Mirror of Justice, Seat of wisdom, Cause of our joy, Spiritual vessel, vessel of honour …..
Those flowing phrases will never leave me. Now a music choice which shares the Litany’s hypnotic attraction. From Patty Griffin, one of the brim full jars of American song, ‘Mary’. I spoke earlier about nursing and nurturing and I can think of no more apposite artist to express those qualities than Emmylou Harris as she invokes in, ‘Light Of The Stable’ the glorious mystery which kindled a light which still burns bright today some two thousand years and more since it first shone in Bethlehem. The poem today is, ‘Christmas Night’ by a contemporary English poet, Lawrence Sail. The darkness at last breathes. a star solid as flesh. This entry was posted in Christmas, Country Music, Folk Music, Ireland, Music and tagged A Stor mo Chroi, Duccio, Emmylou Harris, Lawrence Sail, Light Of The Stable, Loreto Litany, Patty Griffin, The Voice Squad by Thom Hickey. Bookmark the permalink. Just want to appreciate you mentioning this about 700 years old paintings – so very fascinating. Those are the shoulders “da Vinci” stood on. I’m not a religious man and I’m certainly not a Roman Catholic but that Patty Griffin song is exquisite. The lines about the angels singing His glory while Mary stays behind and starts cleaning up the place perfectly express the quiet sacrifice that every mother makes for her child.